Today I learned more than I ever wanted to learn about Schebler SW301 2 barrel carbs from Jon Hargrove. The main thing I learned is that it takes THREE TO FOUR MONTHS to get a carb kit from him and they cost $134 each plus $15 shipping. Because there are four carbs, there are 4 carb kits which some way or another differ from another. 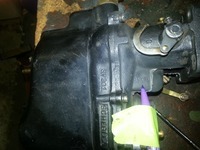 J L is going to post the picture of where you find that number stamped (not embossed) into the body of the carb. Turn the carb on your bench in the position like you are bolting it to the manifold. Facing you, you will find, embossed just under the seam between the upper part and the lower part, on the left hand of the screw attaching both halves, you will find embossed 'SW 301. On the right hand of the screw you will find the word "SCHEBLER". Just above the embossed SW 301 on a sloped plain, you will find the stamped letters and numbers such as SW 434. They are faintly stamped so you may have to wire brush the area to see them. You might want to review his website because it has some neat info on how to troubleshoot your carb. Is this clear as mud? I tried to explain best I can. thanks for making the call. I had emailed him asking about the correct kit and he said "call me" which now I know why. Do you think it is possible to get the carb id without taking it off the car? Here are the pictures. The numbers are at the head of the pen. I think it would be tough to do since the numbers are probably covered with paint and dirt. I think if you take off the four nuts and drop the carb down (with the linkage and springs still attached) you could probably get to it. My bet is that it is kit # CS1694 as that is what all my carbs took. My car has a 434 on it. So it looks like mine is going to clean up without the kit. I'm going to give it a try to see how it runs and I may need to buy one in the end. My carb has been disassembled, cleaned, reassembled and is going back on today. It was very gummy but the limited internal parts were in good shape. I will report on any improvements in the engine running. Most of us have found that Jon Hargrove of Missouri, THE CARBURETOR SHOP, is a very difficult person to do business with. It is his way or the highway. Since I started this thread, I would have deleted it except it has some very good information. I regret recommending THE CARBURETOR SHOP. Deal with him only if you have a very high tolerance for someone who regards his customers as an interruption. The needle and seat included in his kit was the wrong one and would not screw into my carb. I mentioned this John a year or so ago . My carburetor would not take Hargrove parts and my Carburetor fellow had to put the needle in a small lathe and turn it down . They said they had the same trouble with his attitude and parts with other customers . The maddening thing is he would not ship the part USPS he had to use Fedex . Canadian Customs charged me $60 handling fee since it came in by Fedex plus duty . There is no $60 fee with USPS except the duty . I continue to be amazed by Jon Hargrove of THE CARBURETOR SHOP. At his direction I returned four kits I purchased from him that had with wrong needle and seat and sent to him a needle and seat that he included in a kit I bought from him years ago. Instead of correcting his error and sending me correct kits, he sent me a refund for the four kits. I would avoid doing business with him. He is beyond strange! My recent experience with Jon was completely different from what is described above. I have a 1932 Model S and when I called the first time we determined that my carburetor was not original and he needed more information. 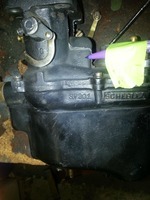 I identified the carburetor as a Stromberg BXOV and called him back. $130 bucks and 3-4 days later my kit arrived USPS. I had some additional questions so I called him back and he answered all my questions. Maybe my experience was an anomaly or maybe he’s seen the light. I don’t know, but I’m happy with my transaction with him.